Why am I being asked to purchase RealPlayer Plus when I already purchased it? Please sign in. This usually happens if you are trying to use a Plus feature (such as DVD burning) without signing in first. One you're signed in, RealPlayer will recognize that you have purchased the Plus version and allow you to use the features you've paid for. Note: This can also happen if you purchased a previous version of RealPlayer Plus (such as RealPlayer 16 Plus) and then updated to the free version of the new RealPlayer 18. If you have RealPlayer Plus and want to keep your premium features after updating, you will need to purchase RealPlayer Plus 18 or pay for a Premium or Unlimited subscription to RealTimes. Solution 1: Enable cookies in RealPlayer. If you do not enable cookies, you won't be able to use the Plus features and services you paid for. Solution 2: Delete and reset your cookie. 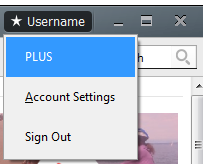 You should now be able to access the Plus features.